It’s so pretty! Or, the post where I get overly excited about business cards. When I was working as a materials scientist, I had business cards. They were company-issued and looked exactly like everyone else’s. Plain white card stock, basic, sterile design and the company logo. I would get so jealous when exchanging cards with people who had unique or interesting cards. 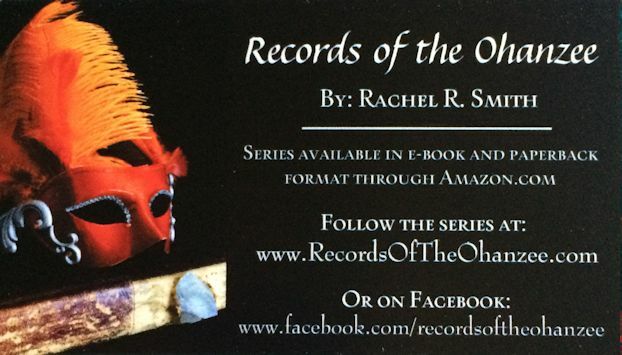 Authors, do you have business cards? How do you spread the word about your books offline? Very nice…and good advice…thank you! I had a personal one even before I stopped working for a firm..I kinda liked the idea that I had a card to my name as a brand..haha. Do check out my last post, I nominated you for the starlight bloggers award…cheerio. Your business card looks fantastic. Really eye-catching. Thank you! I actually made the mask myself so that it would match the one Nerissa wears in Book 1. I think it photographed really well!